Between your racist uncle's borderline-unintelligible rants about making America great again and your Bernie Bro friends' dramatic #ImWithHer coming out essays, your Facebook News Feed has already made the divisive shitshow of the 2016 presidential election uncomfortably personal. As if that isn't unbearable enough, the social media overlord just introduced a new feature that lets you post your endorsements for political candidates. As explained in a report by Mashable, all you have to do is visit a candidate's Facebook page, click the "Endorse" button, and write our your personal endorsement to make the case for why your friends, followers, and randos who come across your profile should vote for that person. Like with other posts to your Timeline, you can restrict who's able to see your endorsements. 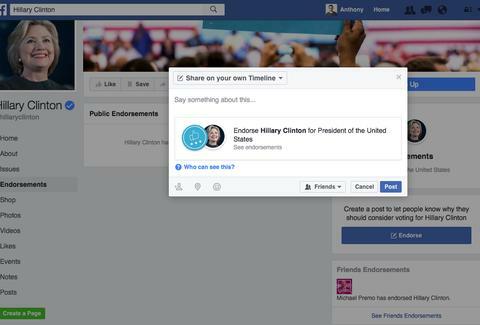 Endorsements set as public can be selected by the candidate to appear on their page. Are you sobbing yet? In case you're actually interested in contributing to the new level of election inanity on Facebook, a new section on the company's Help Center details exactly how to post an endorsement and how the privacy settings work. Or you can always stick to liking political pages, posting passive aggressive links, penning close-minded rants, and duking it out in the comments like a goddam patriot. Whatever you do, be sure to vote on November 8th. Tony Merevick is Cities News Editor at Thrillist and will not be posting his endorsement on Facebook. Send news tips to news@thrillist.com and follow him on Twitter @tonymerevick.